Dance-craze brand Zumba Fitness has hired George P Johnson as its lead agency and is planning a series of events over the course of 2012. 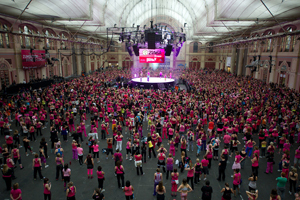 The agency's first B2B commission is to create a training event for 6,000 of Zumba's certified instructors in Excel London at the end of February 2012. George P Johnson will produce the event, which will help Zumba train its UK instructors on the latest dance moves and provide them with information on how best to teach classes. Instructors will get an opportunity to gain extra accreditations at the event, providing they meet the company's guidelines. George P Johnson's executive director of business development, Kevin Jackson, said: "This is a huge craze that is sweeping the globe, so it is great to take them on as a client. Zumba has recently been subject of a computer game, available on consoles, so it's becoming an extremely successful household name. "The business-to-business event will include advice from the company's top instructors, some of whom will have travelled over from Orlando." Zumba is a Latin-inspired dance-fitness programme introduced in 2001, with more than 12 million people attending weekly Zumba classes across more than 125 countries. Read more about George P Johnson's expansion plans on p32.